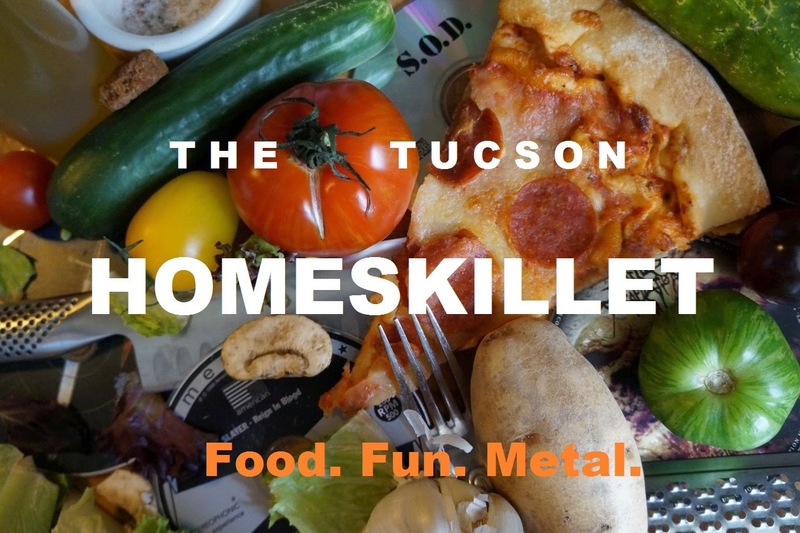 The Tucson Homeskillet: New Kids on the Beer Block: The Tucson Hop Shop! I actually discovered the Tucson Hop Shop by accident. It was a wrong turn. Wanting to turn left on Country Club from Ft. Lowell, I ended up going too far and turning on Dodge. Trying to get to a school where Barrio Bread was selling their amazing wares, I found myself scooching through the parking lot of the Metal Arts Village thinking maybe I could get a stout rye loaf here perhaps. Nope. I mean, there was a food truck set up but I was pretty focused on a pain epi for a dinner I had planned that night. Instead I made a delightful discovery. Nestled in the courtyard, wide hangar like sliding door open in the late afternoon air, was a corner shop calling themselves the Tucson Hop Shop. Making a mental note of it as I was trying to get un-lost, I eventually found my way back to the correct destination, but very curious as to what that place might be. As dinner simmered and the bread was warming that night, I asked the internet what the Tucson Hop Shop actually was. At first I thought it was a beer brewing location, you know, a place to create and brew your own beer if you don't have the means and the space to do so. It was kinda that but...not really. Because it was oh so much more. They do have artisanal beer making kits, but they are also a beer garden with an ever rotating and extremely alluring list of beers on tap along with being a craft beer bottle shop and growler filling station. This peaked my hoppy interest immediately. Sure there are other craft beer establishments in town, but not one as close as the Hop Shop...to us anyway, and not one as "homey" as this one felt...online anyway. So I lit out to the Tucson Hop Shop one day to see what all the brew ha ha was all about. The moment I walked through the open space of the Hop Shop, I immediately felt at ease. This was the kind of hangout I could see myself drinking and chilling on any given night. Or day. Or...anytime actually. There was a long wooden bar occupied by a few afternoon friendly faces, to the right was a "beer cellar" that sold acres of craft beer bottles and brew kits and there was even an upstairs where you can relax on a cozy couch or set up your laptop on a vintage oak desk. The best part was the large back area set up with tables and chairs with games to play and room for your dog to meander. I was a big fan of this place within seconds. After ordering a snifter of IPA, I was lucky enough to meet one of the owners, Jessie Zugerman, and chat about how all of this Hop Shop business came about. "Dave (Zugerman, her husband for ten years and business partner) and I met in college around 1997 back in Oregon," she says trying to organize new beer orders coming in, "and we've been big beer lovers and brewers since then. I'm actually a pharmacist and have been for six years and Dave, after getting his MBA, started working in the financial sector here but soon became really disenchanted with the day to day grind. We have always wanted to stake a claim in Tucson's growing craft beer industry so in the summer of 2014 we decided it was now or never and just jumped headlong off of that cliff." "I am actually a Tucson native, so after we graduated the University of Oregon in 2001 we had a decision: spend the winter in his hometown of Chicago, the winter!, or come back home to Tucson. Yeah, pretty easy decision seeing what the impending forecast had waiting for us in Illinois." Now that Dave and Jessie were back in Tucson, working respected jobs but knowing they wanted to do their own thing, I just had to ask why beer and why Tucson for their business venture. "Why not!? ", Jessie beams in the tall wooden treehouse that is the Hop Shop. "Tucson rocks. Beer rocks. I mean craft beer, real beer, not the swill variety, is a builder of communities. Craft beer has always put an emphasis on quality products, quality ingredients even quality people! Always local sourcing when possible; quality over quantity. "This is an industry we can take absolute pride in being a part of, because the 'industry', in general, doesn't treat their products or employees like widgets. Tucson in particular continues to see a huge boom in this segment and people are seeking out craft beer in droves." One of the best things about the Tucson Hop Shop is its location. With downtown and the surrounding areas being crammed with similar concepts, it is very exhilarating to have such a noble house of community and refreshments resting itself in a rather unlikely neighborhood nook. Nestled between art lofts, the Hop Shop beams with a certain welcoming panache that only comes from people that really give a crap about what they are doing and where they put their focus into. How can you not have a good time here? "Our concept was to create a social outpost on the North side of Tucson, bringing some of the new found, beer soaked life of downtown closer to home," Zugerman informs as I delight in my next flagon of ale. "We also wanted to be accessible from "The Loop" along the Rillito River path and have an outdoor space for a lounge. "After about a year of searching we heard about this space from a mutual friend and after just one walk through and meeting with the landlord, boom, we were sold. We couldn't ask for a better spot or better neighbors. And the urban beer garden we created out back is everything we have dreamed about and more. This is the spot we waited so long to find." Once the location was set, the concept came together and the hard work began. After a while, Jessie and Dave were in business, the craft beer business, but beer is just the foundation for what they do. "We offer nineteen taps of craft beer from around the world," notes Jessie as she pours herself a taster of a new lager arrival, "plus barrel aged, cold brewed Presta Coffee on our twentieth nitro tap. We also serve red and white wine and even a sparkling variety in a pink can! There's about three hundred different bottles and cans of craft beer as well as a wide selection of non-alcoholic drinks such as lemonades, cream sodas and such. You know...for the kids." Where to begin, where to start? That's right, the Tucson Hop Shop is kid friendly with plenty of games to play and sodas to drink seeing as the Zugerman's themselves are proud parents. Now that the coolers are stocked, the doors open and business is growing, I had to know the highs and lows of owning a craft beer shop in Tucson. It was an easy answer for Jessie. "The people, the community," she states on the obvious highs, "and, of course, the beer! We meet so many wonderful people with stories to tell and connections to this community everyday. It's a blast getting to know our customers. We already have a few regulars and its fun to have the numbers increase as we move forward. One of the greatest things is the broad demographics we are getting from our surrounding communities: Students, athletes, business professionals, families with kids, artists...its amazing to see people just enjoying the company of each other each day in our beer garden. "Plus we get to try new beers everyday. So I'd be lying if I said that wasn't awesome." So far the one big preoblem they run into daily really isn't a monumental one, but rather a, shall we say, "labor of love". "Trying to keep the coolers stocked to represent our various styles spread out among twenty taps can be challenging," she confides with a smile and shrug. "I mean, you wouldn't want nineteen IPAs and just one stout would you?" 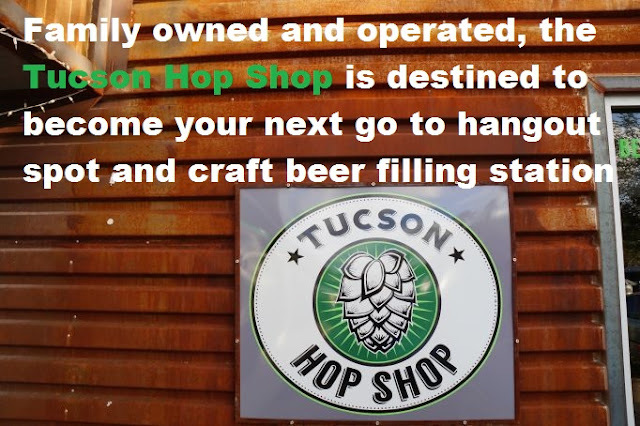 But the Tucson Hop Shop is more than just a beer lovers paradise, it's also host to a variety of events and community sponsored affairs. With a big back yard like these guys have, you think they just wanna keep it to just sipping beer in the brisk night air? Actually, that sounds amazing but....no. "Oh wow," Jessie reflects as she looks over their event calendar. "Well every full moon, all of the surrounding artists have an open studio and we always make sure to have a food truck here for that, plus there's live music out back and all sorts of fun. Upcoming we are hosting a Girls Pint Out gathering, there is going to be a holiday beer and food pairing tutorial out back in the garden, Founder's Rainbow of IPA is coming up soon...oh, we have Wooden Tooth Records spinning vinyl out back one night, that should be fun. "Really just keep checking the events page on our website and be sure to follow us on Facebook. There's just a lot going on." What is the future of the Tucson Hop Shop? Jessie grins. "We don't have any crazy plans to open up like a hundred Hop Shops, but if an opportunity arose to create the same kind of community outpost and outdoor environment here in town we would definitely consider it. "But for now, all we want to do is work hard, do what we love and create a space for our family and yours to enjoy. So far so good!" Beer. Food trucks. Beer. Comfy couches. Beer. Outdoor patio. Beer. Games. Beer. Music. And...what was that other thing? Well depicted ! I never thought I'd be a regular at a bar and yet... This beergarden, front porch, event magnet has become a homey waystation where I stop in for a 5 oz. Sip of something.tasty several times a week with or wothout dog and friends and.family. It is a warm, smiley haven. You captured it and we sure are licky to have it close by. Wonderful place with fantastic brews. The people are friendly and you can taste a beer before you buy it. What more could you ask for? Today, there area unit several bottles created with none harmful materials. Personal preference comes in here with selections of chrome steel, aluminum or plastic for more information visit here Shara.